Top: Deluxe grill from Landmann. Bottom: Weber’s Q series fits almost anywhere. Did you fire up the grill for Mother’s Day? It’s one of the biggest barbecue days of the year, with 34% 0f grill owners cooking celebrate Mom. It following the Fourth of July (76%), Labor Day (62%), Memorial Day (62%) and Father’s Day (49%) in popularity. 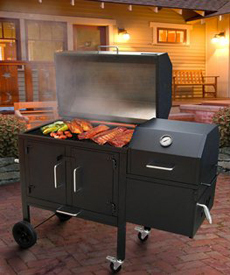 More than 75% of Americans own a grill or smoker. May is National Barbecue Month: A survey from the Hearth, Patio & Barbecue Association (HPBA) names grilling as America’s favorite patio pastime. It can be quite a feast: Beyond proteins and veggies, people grill everything from bread, pizza and quesadillas to fruit and other desserts. Whether for easy weeknight dinners, weekend feasts or even breakfast, here’s the scoop from HPBA’s most recent State of the Barbecue Industry Report, from a survey conducted in July and August, 2015.
Who has a grill? 75% of U.S. adults own a grill or smoker. Gas, charcoal or electric? 62% of households have gas grill, 53% have a charcoal grill and 12% have an electric grill. Two percent own a wood pellet grill and 8% are thinking of purchasing one this year. Why so much grilling? 71% say it’s to improve flavor, 54% simply enjoy grilling and 42% like it for entertaining family and friends. Seasonal or year-round? 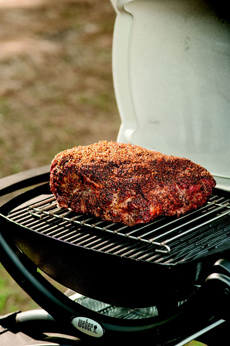 63% of grill owners use their grill or smoker year-round; 43% cook at least once a month during winter. Grill accessories. Half of all grill owners have the most basic grilling accessories: cleaning brush, tongs, and gloves/mitts (hmm…what does the other half use?). The most popular new accessories owners plan to buy include pizza stones, broiling baskets and cooking planks. Outdoor kitchens: 10% of grill owners have a full “backyard kitchen,” including premium furniture and lighting. Barbecued breakfast: 11% of grill owners prepared breakfast on a grill in the past year. Beyond the backyard: Nearly one third of grill owners (31%) grilled someplace other than their homes in the past year, including 24% who grilled while camping. Barbecue plans: Nearly half of U.S. adults (45%) plan to purchase a new grill or smoker in 2016, while nearly a third of current owners (30%) plan to grill with greater frequency. A grill or open hearth/fireplace—used to barbecue food. The meat, poultry or fish that is barbecued. Meat or poultry that is basted in a sweetened “barbecue sauce” during cooking. An outdoor party or picnic at which barbecued food is served. Barbecue and barbeque are alternative spellings, along with the short form BBQ.